Please never pay any money up front for part 1 training materials! Instead, visit www.desktopdriving.co.uk/ and click ADI and PDi products, where you can purchase a premier starter pack for �2 or a standard pack for �.56. (prices correct as of 01.11.10, these packs contain the full DSA recommended reading list for the whole ADI qualification process, the packs also contain the entire DSA question bank as well as all of the answers). I would strongly recommend that all PDI's do part 1 themselves, not only will this save a lot of money, it will hopefuly stop PDI's contracting to over priced courses and signing legally binding contracts from which there is no escape, this is actually easier to do than you may think, especially given the high pressure sales tactics used by some of the larger training companies out there. Doing the part 1 yourself will cost �3.56 with the standard pack or �2 with the premier starter pack, including the � cost of the part 1 test, (provided you pass 1st time). Please be aware that it is not unusual for some training companies to ask for many hundreds of pounds up front before any part 1 materials are supplied and even then you may not receive the full DSA recommended reading list. Every PDI I have trained has managed to pass the part 1 test with no help at all from me, so unless you feel you are really going to struggle, do it yourself. However, should any PDI be in need of any help with their theory test, then I will be more than happy to help. There are of course other benefits to doing the part 1 yourself, it will free up a few months to allow you to thoroughly research the industry so that when you do come to select a training provider you will have all of the relevant facts at your disposal. I have included this information for two distinct reasons; firstly I want to be totally transparent with all of the information I supply, there are absolutely no hidden costs associated with any of the training I deliver, and secondly, because, over the years I have met many dozens of PDI's who had signed up with the first training provider they spoke to, all of whom subsequently went on to bitterly regret that decision as they had to then spend even more money on rescue training with myself. 10 hours of 1:1 in car training with a GRADE 6 ORDIT REGISTERED TRAINER at � per hour = �0. 40 hours of 1:1 in car instructor training with a GRADE 6 ORDIT REGISTERED TRAINER, charged at � per hour = �00. Please note that should further training be required to pass any section of the qualifying test, then all further training will be charged at � per hour. 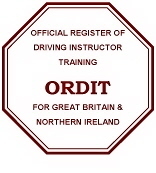 ORDIT is the Official Register of Driving Instructor Training and is overseen by the DSA. Entry to the ORDIT register involves the trainer passing a stringent examination of their training ability under the watchful eye of a highly trained Driving Standards Agency examiner. The examiner sits in the back of a training session and assesses the ability of the trainer and also looks at whether or not the client is receiving value for money. ORDIT qualification should be the minimum standard that you demand from any training body, if they are not ORDIT registered, then ask yourself why? The pass rate for entry to the ORDIT register is currently around 50%, this ensures that basic minimum standards are in place for all ORDIT trainers nationwide and that adequate training records are in place. The ORDIT register has not yet become compulsory and this means that any driving instructor can offer instructor training services, irrespective of how long they have been qualified as instructors themselves, or what grade they are, or further training skills they possess . As a simple rule of thumb, when looking at websites and other promotional material trying to sell you instructor training courses you can be absolutely certain that all ORDIT registered trainers, especially if they are also highly qualified grade 6 trainers, will always include this information on their websites. If this information is absent then you can also be equally sure that any training will not be carried out by a grade 6 ORDIT registered trainer! IRRESPECTIVE OF HOW GOOD THEY CLAIM TO BE!! Unfortunately there are web sites out there which simply declare the trainer to be the best and that you should ensure that you get the best by undertaking training with them etc, etc. Please do not be taken in by these claims, instead, call them and ask for details of their grading and if they are ORDIT and also ask for details of any instructors that they are claiming to have trained, in fact all the things that I have been so transparent about on this website. 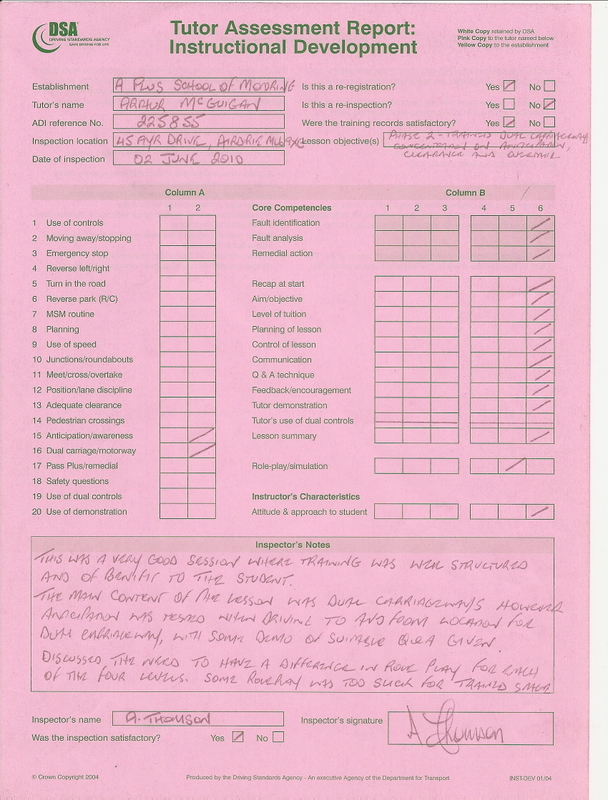 I have included my last ORDIT inspection report below, it shows that the level of the training session that was observed by the DSA examiner was of a very high standard indeed and I am very proud of the fact that I attained a grade 6 for all of the core competencies. I have published both my ORDIT and Check Test results so that prospective driving Instructors will have no doubt about the quality of the training that they will receive should they decide to train with A-plus School of Motoring. The marking criteria for the ORDIT is the exact same as that for the ADI Check Test ranging from dangerous instruction at grade 1 to excellent instruction at grade 6. The training that I received with Arthur was extremely well structured and very easy to follow, with handouts after each training session and homework set for the next one. If I struggled with any aspect of the training, then Arthur was only a phone call away and I found him to be ever helpful throughout all of my training. I would highly recommend Arthur Mcguigan to anyone who is thinking of becoming a driving instructor. Without the expert training that I received from Arthur I would never have realised my dream of being a self-employed driving instructor with my own successful school. I initially trained with the Instructor College in Glasgow, but was dismayed to find that two of my part 3 trainers had less than 28 months experience between them as Approved Driving Instructors, (ADI's). One had actually only been an ADI for 10 months and was now employed as an ADI trainer! I found the training that I received from the college was pretty much a waste of time and money and I soon realised that I would have to seek alternative training if I was ever going to qualify as an ADI. I contacted Arthur and explained my situation to him and booked a training session. To say that this training session was an eye opener was an understatement, I felt I learned more in those 2 hours from Arthur than I would have thought possible in such a short time. The training was very well structured and easy to follow, and it made total sense. As my training with Arthur progressed I started to fully understand exactly what was expected of me in the part 3 exam. I went on to pass my part 3 exam with good grades and I received a glowing debrief from the examiner. I would gladly recommend Arthur Mcguigan to anyone who wants to train to become a driving instructor. The training I received from Arthur was absolutely fantastic and I am really enjoying my new career as a driving instructor. Thanks again Arthur, I couldn't have done it without you. I was sitting in the test centre waiting room before my part three exam when I first met Arthur, he had mentioned that he was an ORDIT registered trainer and after I failed my part three exam I realised it might be a good idea to phone Arthur for some additional training. I had already paid almost �000 to a large national training organisation and completed 62 hours of part 3 training but I still felt very confused over many aspects of the Pre Set Tests and I left every single training session feeling totally demoralised and wanting to give up. I have absolutely no doubt that without Arthur's help, great attitude and professionalism I would not have passed my part three. Arthur was very thorough going through the PSTs and found the weaknesses in my training very quickly (as any good trainer should). The standard of the training that I received from arthur was exceptional and the explanations he gave me seemed so simple to understand compared to my previous training. I also noticed immediately that I now finished all of my training sessions on a high and really looking forward to the next one. With hindsight I now realise that I was totally undertrained by my original training company and I was not the only one, a fellow trainee who became a close personal friend also trained with them but unlike myself they simply could not afford to pay to take any more training. As a direct result of this they went on to fail their part 3 three times and were left with absolutely nothing to show for all the hard work they had put into their side of the training not to mention the �000 it had cost them for a truly dreadful training experience. In order to hopefully prevent this happening to anyone else we have both complained in the strongest terms to the Driving Standards Agency and the training company involved. Thank you so much Arthur for all your help and advice during our training and I am really looking forward to doing my check test training with you. I initially trained with RED, the Instructor College in Edinburgh at a cost of �500 and had received around 60 hours of part 3 training, but, I realised that I was still nowhere near ready for my part 3 exam. my trainers were telling me that no one ever passed first time anyway so I should just have a go and see how I get on, this was the final straw as I had no intention of throwing away one of my 3 lives when I knew I would never pass. The training I had received from the college was dreadful but I had payed up front and couldn't get out of the contract. I knew I would never pass unless I took further training, so I asked an ADI friend if they could recommend someone to get me through and that was how I met Arthur. From the very first session Arthur rebuilt my shattered confidence and helped me to understand exactly why I had been struggling, the training now seemed so simple and I learned an incredible amount during my training sessions with Arthur. When Arthur told me to book my part 3 test I was incredibly nervous but I also knew that I now had a realistic chance of passing, I shouldn't have worried, in spite of what the college trainers had told me I went on to pass my part 3 test first time. Arthur is an absolutely brilliant trainer and I would recommend him to anyone who wants to become a Driving Instructor. Hi my name is Lynda Gibb I am now a fully qualified driving instructor thanks to Arthur. When I started training for my part 3 I chose another instructor from the Aidrie area, I can say now that this training was definitely not helping me to pass my PT3 exam, when I decided to leave this trainer I was refused my record of training hours which I had already paid for 26 hours and needed desperately to get a trainee licence. This trainer just took complete advantage of me. I felt I was right back at the beginning except for being hundreds of pounds out of pocket. I had to then find cheaper training elsewhere and pay for another 60 hours of part three training to get my trainee licence, this training was not too great either. Eventually I got a trainee badge and after a few months I sat my first attempt at the PT3 exam, I failed miserably. All the training I had recieved had not prepared me for it at all! Thats when I decided to contact Arthur. My confidence was non-existent and my skills were rubbish however after just a few hours training with Arthur my confidence grew and the standard of training I recieved was exceptional compared with the previous training. I could see immediately the difference in the standard of training I received from Arthur. I booked another test and passed on my second attempt. phew!! If you are looking for a PT3 trainer I would highly reccomend Arthur, I went with another trainer first because he was a bit cheaper what a big mistake that was. If I continued my training with the first guy I don`t think I would ever have passed my PT3. If I had trained with Arthur from the beginning I would have no doubt passed on my first attempt and I would not have lost all my confidence. So thank you Arthur and I will recommend you to everyone that I meet that is looking for driver training. ( Except of course my learners because I need them!!!). I trained with the instructor college/Red in Edinburgh and finished my training feeling like a number not a person, I had totally lost all of my confidence, and with no help forthcoming from the training college. I felt I had to find someone myself who could help get me through my Part 3 test. After training with Arthur for 3 or 4 sessions my confidence began to return, what a difference in the standard of training I received with Arthur! I passed my part 3 first time with a grade 6 and a grade 4 and I can't thank Arthur enough, If I had went on what the college had taught me I would never have qualified. I would recommend Arthur to anyone looking to become a driving instructor, his training methods definitely work, I only wish I had went to him before I wasted thousands with the college. The lack of a compulsory register for the driving instructor training industry is why A-plus School of Motoring has entered the ORDIT register. Given the dreadful state of the current instructor training industry the government will eventually order the DSA to make ORDIT registration compulsory for all ADI training organisations. I hope that by undertaking the further training that I have, (before ORDIT registration is made compulsory), and by subsequently improving my own skill base and coaching ability to a level which has allowed me to become both ORDIT and FLEET registered at the highest possible grade of 6 for both registers; It will set me apart as a highly professional trainer who can help any PDI realise their ambition to change careers and become a fully qualified ADI. I only offer courses on a training ratio of 1:1 and on a pay as you train basis, this way if you decide to stop your training at any time you will not have thrown away thousands of pounds of your savings, or even worse face being tied in to a legally binding credit agreement. I also run part 3 rescue packages with all training tailored to the specific needs of the PDI. If any PDI reading this is unfortunate enough to have received sub-standard training previously, or is concerned that the training that they are currently receiving is not meeting their needs and would like further help or information, then please feel free to contact me personally for an informal chat or to book a training session. I will also be happy to discuss any and all queries from PDI's at any stage of the qualification process, so that if training is undertaken, then it is done so with all of the relevant facts at their disposal. I also run driving instructor assessment courses. These courses are for anyone who is considering a career in driving instruction but is unsure whether or not they will be suited to the job. The assessment is two and a half hours in duration and will examine the candidates driving ability, their ability to follow instruction and learn new information, and last but by no means least their teaching ability. This assessment will give the candidate a chance to meet me personally and discuss any queries or concerns that they may have. It also gives the candidate a chance to experience the level of training that will be provided throughout their training course, should they decide to undertake further training. Some of the more unscrupulous training companies are more concerned about the PDI's credit rating than they are about their suitability for the job and will train anyone who can pay the fees, however, training candidates that have only a slim chance at best of qualifying is a totally unethical business practice and I would urge all PDI's to undertake an assessment with an independent ORDIT registered trainer before subscribing to any ADI training course. Whilst there is currently a throughput of over 30,000 PDI's yearly, only a few thousand of these PDI's will ever become ADI's and make it onto the register. If you have any doubts about your own suitability to become an ADI then please contact me to arrange a no obligation assessment before spending thousands of pounds on a training course which you may never finish. FACTS YOU SHOULD KNOW BEFORE SPENDING ANY MONEY ON INSTRUCTOR TRAINING! I hope that the following information will help PDI's avoid some of the most common pitfalls associated with becoming a driving instructor. The single biggest factor in whether a PDI qualifies or fails is their choice of trainer, or training organisation. There are literally hundreds of websites out there encouraging you to undertake training immediately and to commit to spending thousands of pounds to secure a new career. These sites promise earnings in excess of �,000 with absolutely no qualifications needed, car supplied, work guaranteed on qualification, fast track training etc, etc. However, as you read through these sites you will usually find two things missing; Information about the trainer's qualifications, and the truth about how difficult it can be to pass the qualifying exam. Please do your homework before you spend any money, this really is the golden rule, it is a well known fact that it is much harder to re-train someone who has previously been exposed to poor training than it is to train them correctly from the outset. Unfortunately, (as Paul's experience above verifies), there are actually training establishments out there who are using trainers with little or no experience as driving instructors let alone trainers, or who are as yet ungraded or have been assessed as the basic minimum standard grade 4. I am sure you will agree that this is an absolute disgrace and that PDI's deserve at least a half chance of qualifying by receiving the best training available from well qualified and experienced trainers, especially considering the vast sums of money being charged to provide this training. In actual fact any ADI can set themselves up as an instructor trainer the day after they qualify, even if they have never delivered so much as a single learner lesson. I am sure that you find this anomaly as absurd as I do, however, as long as this situation is allowed to continue there will be no change in the dreadfully low pass rate for the ADI qualifying exam. You should always ask to see what qualifications your trainer holds before you spend any money on training, whether they are independent or part of a larger company. Any reputable trainer will be more than happy to show you their last check test grading sheet, their last observed ORDIT training inspection report, as well as any further vocational qualifications they hold. Also ensure that you are going to be trained by the principal trainer and not a prospective (trainee) trainer. Always ask what ratio the training will be delivered at before you spend any money as this will directly affect your chances of qualification. Many training establishments train on a ratio of 2:1, (that is two PDI's to one trainer), some trainers even train on a ratio of 3:1, If you sign up for one of these courses then you will only receive one half, or one third of the agreed time actively learning, the rest of the time will be spent in the back of the car observing your training partner/partners. If your training partners are struggling more than you, then you may not even get your full allotted time. With ADI training costing thousands of pounds, you should always ensure that your training will be on a ratio of 1:1 before you sign up. Many training companies use high powered sales techniques which offer projected earnings and guaranteed work upon qualification as an ADI. These companies will usually also offer you a guaranteed placement on the training course if you sign up within a week and may even offer you a train now and pay in a year credit agreement. These are simply hooks designed to get you to sign up shortly after the first meeting, but please remember that once a contract is signed, the money is almost always NON REFUNDABLE. Before you sign up to any training course carry out thorough research, seek impartial advice, try to talk to individuals who have recently taken driving instructor courses, or are currently on them. Also speak to the trade associations whose contact details can be found under trade associations and professional bodies in the Yellow Pages. Be wary of claims about fast track training and qualification, you are tied to the Driving Standards Agency waiting times for examinations and nine months is a sensible time scale if you have no other working commitments. If the claims sound too good to be true they probably are. Never sign up on the first day/week, and never pay the full amount for your training up front! If you susequently decide that the job is not for you, or if you fail the part 2 of the qualifying exam, then you will most probably lose your money, or be legally required to continue paying off any credit agreement that you signed. The facts regarding availability of work after qualifying are that almost all driving instructors in Britain are self employed and can get work easily from all of the larger driving schools as a franchisee. Please don't select a training provider on the grounds that they are promising you a guaranteed placement with their driving school upon qualification, some may even offer you money back after you've passed in the form of discounted franchise fees, however, this ties you into a hefty franchise agreement and won't suit everyone. New instructors may also choose to start their own driving schools and seek independence from the outset, whichever route you decide to follow your training provider should be willing to help with training and advice. Please also remember that under the current rules anyone can deliver instructor training for parts 1 and 3 of the qualifying exam: they don't even need to be a driving instructor themselves! The inadequacies which currently exist within the regulatory system overseeing the driving instructor training industry consistently allow PDI's to be charged thousands of pounds with absolutely NO GUARANTEE that they will receive professional training for parts 1 & 3 of the qualifying exam. Whilst this may seem laughable, I know from personal experience of providing PDI's with PART 3 RESCUE TRAINING that not one of them finds the situation in which they have found themselves to be the least bit funny. The vast majority of PDI's, (remember there is a 72% fail rate), only begin to realise how poor their teaching skills are when they sit their part 3 exam for the first time, (You are only allowed 3 attempts at both the part 2 & 3 sections of the exam). It is only when they fail this first attempt abysmally and the examiner tells them how far away from the required standard they actually are that they realise just how poorly they have been trained. The above facts are why I have been so honest concerning the shortfalls within the instructor training industry. Unfortunately, it is all too common to meet PDI's who know that they have been woefully under-trained but have signed a legally binding contract, or have already spent thousands of pounds on inferior training. At this late stage these PDI's find themselves under incredible pressure with the dual worries of having their future career as a driving instructor hanging in the balance, coupled with having to spend even more money on re-training before their final attempt at the Part 3 exam. driving instruction is an excellent career choice for many people and I hope that I have not put anyone off pursuing driving instruction as a career change, indeed with the right training you will not only be much more likely to qualify, you will also go on to become a far better driving instructor in the long term. Thanks for taking the time to visit my website and I hope that PDI's in particular have found the above information helpful. Whoever you decide to train with, let me wish you good luck and every success with your training to become an ADI.